Bushmills, Co. Antrim, 26 September 2016: Today, Bushmills® Irish Whiskey announced the launch of PORT CASK RESERVE – the second and latest edition in the Bushmills Steamship Collection – a rare and unique range of cask-matured Bushmills Irish Whiskeys inspired by the extraordinary voyages of the SS Bushmills steamship. 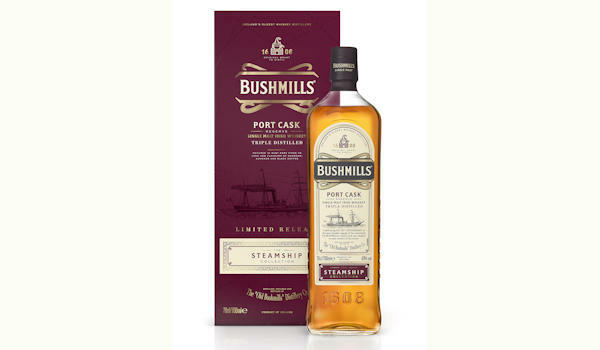 As a duty free exclusive, this new variant follows last year’s successful launch of Bushmills SHERRY CASK RESERVE, marking the 125th anniversary of the maiden voyage of the SS Bushmills. In 1890, the SS Bushmills delivered Bushmills Irish Whiskey to new corners of the world and with it established knowledge and relationships from some of the world’s finest wine and spirit producers. With over 400 years of whiskey-making heritage and as experts in wood selection, it is these relationships that have served the Old Bushmills Distillery to this day, helping Bushmills master distillers explore the potential of maturing whiskey in exclusive and rare casks. Helen Mulholland, Master Blender of Bushmills Irish Whiskey, said; “We pride ourselves on understanding the different nuances that different barrels impart on our whiskey. Up to 80% of the character of whiskey comes from the cask, so I make it my mission to travel to Portugal to meet with the craftsmen and estate owners from Douro Valley. “As a region whose stony soil yields only low quantities of grapes which are of outstanding quality and perfect for making port, it is here where I personally select the best casks for PORT CASK RESERVE. After a seasoning period of at least three years they are emptied and shipped back to Bushmills to be filled with our whiskey – letting the residual flavours from the charred wood work their magic. The result is our trademark rich, complex and smooth triple-distilled single malt whiskey with subtle elegant notes of damson, black coffee and almonds. Presented in a hand-crafted box featuring a 70cl bottle, Bushmills PORT CASK RESERVE has been fully matured in ruby port pipes which impart luscious and complex flavours of the port wine into this unique whiskey. Priced at RSP £99 for 70cl, travellers can pick up a bottle of Bushmills PORT CASK RESERVE, alongside the SHERRY CASK RESERVE edition at selected global travel retail outlets, from November 2016.